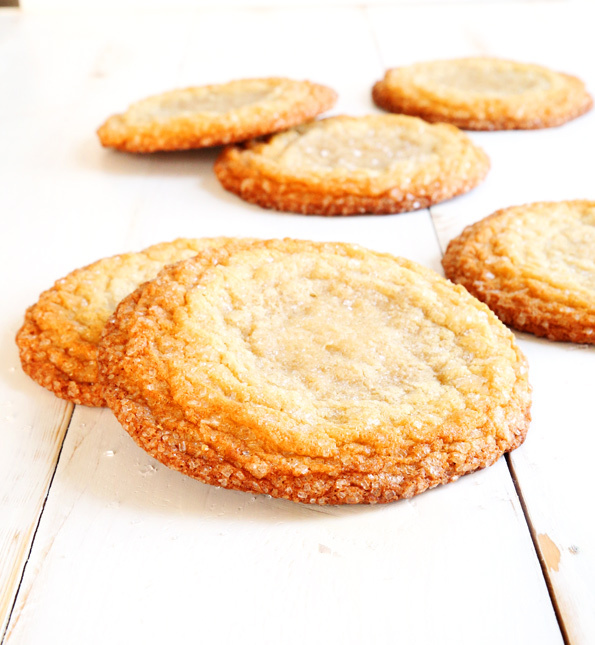 New York Times-Style Gluten Free Sugar Cookies | Great gluten free recipes for every occasion. Crispy on the outside, impossibly chewy on the inside, these are New York Times-Style gluten free sugar cookies. 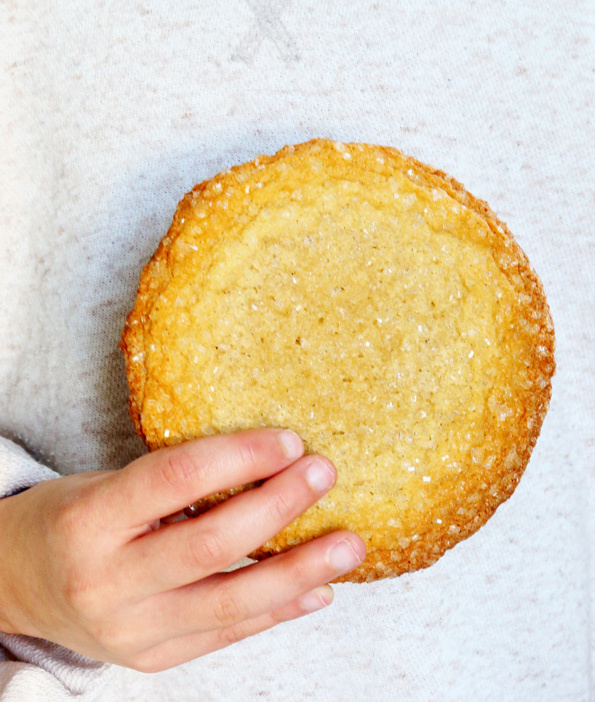 They’re unlike any other sugar cookie you’ve ever had. Feast your eyes, and then your belly! Never one to leave well enough alone (just ask my husband), these New York Times-Style gluten free sugar cookies do three things: (1) They round out our stash of gluten free sugar cookies recipes here on the blog (well not completely, but still) (2) They beat the New York Times-Style cookie recipe category into the ground (maybe); and (3) They make for very easy (yes very easy! ), very sparkly New Year’s Eve cookies. You know, to ring in the New Year in style—with minimal effort. Like their chocolate chip cousins, their double chocolate chip cousins, and their oatmeal chocolate chip cousins, these New York Times-Style cookies are crispy on the outside and chewy on the inside. 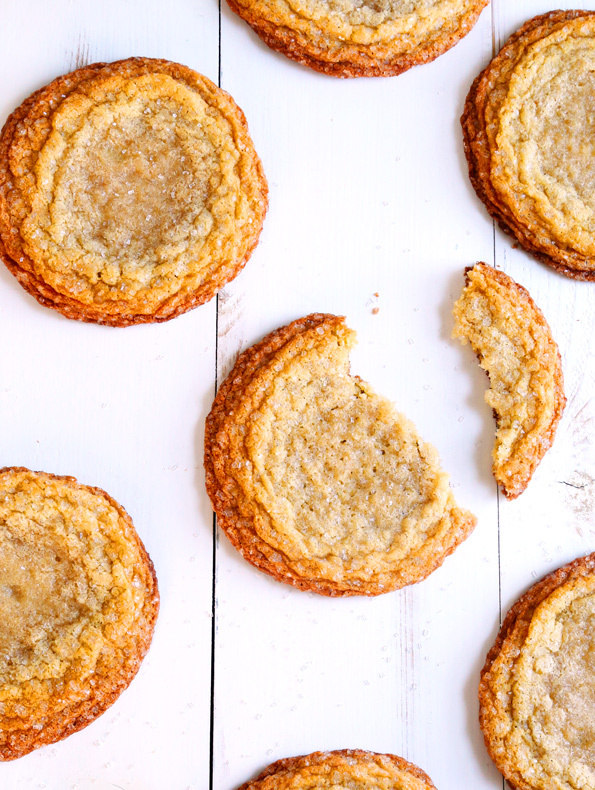 Their texture is simply not like any other type of cookie, gluten free or not! And, at about 5-inches in diameter, their very size makes them festive, even without the fancy sparkly sugar. The original New York Times chocolate chip cookies recipe, which spawned this whole phenomenon, revolutionized the entire concept of the “ordinary” (but always-first-to-go-at-a-party, along with pigs in blankets (we’re a simple people)) chocolate chip cookie by calling for a mix of cake flour and bread flour. Well, cake flour is nothing more than all purpose flour with some cornstarch thrown in, and bread flour? Well, ever since GFOAS Bakes Bread, well, we’ve got that now. You can, of course, make these very special gluten free sugar cookies without chilling the dough for at least 12 hours, but if you throw together the dough tonight you can be making the cookies by first thing tomorrow morning so … why not? And you can, of course, make chewy sugar cookies without the bread flour, but then I guess you (and your fellow New Year’s revelers) just won’t know what you’re missing! In a large bowl, place the all purpose flour, xanthan gum, cornstarch, bread flour, baking soda, baking powder, salt and granulated sugar, and whisk to combine well. Create a well in the center of the dry ingredients and add the butter, egg, egg yolk and vanilla, mixing to combine after each addition. The dough will be thick. Wrap the cookie dough tightly in plastic wrap, and refrigerate ideally for at least 12 and up to 72 hours. Chilling the dough for this time is not strictly necessary for a successful cookie, but essential for the absolute blow-your-mind perfect texture sugar cookie. The choice is yours! On baking day, preheat your oven to 350°F. Line three large rimmed baking sheets with unbleached parchment paper. Divide the dough into 9 balls, each about 2 3/4 ounces (the size of golf balls), and place them at least 6 inches apart from one another on the prepared baking sheets. 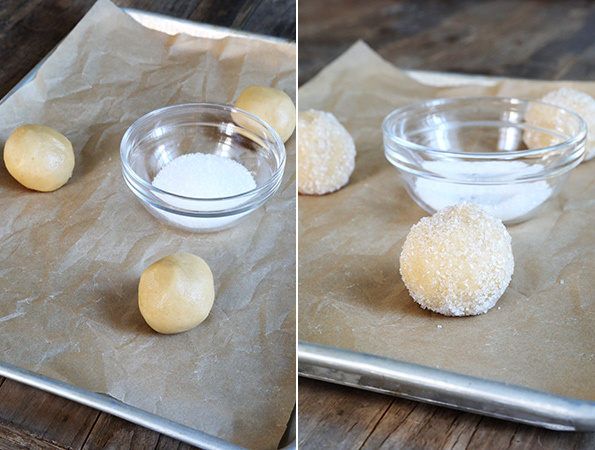 Roll each ball of dough in the sparkling or coarse sugar to coat completely. Place the baking sheets, one at a time, in the preheated oven. Bake until golden brown all over but still soft toward the center (about 15 minutes). The cookies will spread to about 5-inches in diameter. Allow to cool on the baking sheet for at least 10 minutes, or until set before transferring to a wire rack to cool completely. Adapted from my recipe for New York Times-Style Gluten Free Chocolate Chip Cookies, which was adapted from the famous New York Times Chocolate Chip Cookie recipe. P.S. If you haven’t yet, I hope you’ll consider picking up a copy of Gluten Free on a Shoestring Bakes Bread, and perhaps preordering Gluten Free Classic Snacks?! Your support means everything to me! Just tried these but as I can’t get Expandex (I’m UK-based) I used Isabel’s Baking Fix instead. They’re delicious! Omg! The possibilities are endless with these, serve one with ice cream, use one as an individual fruit pizza….. This rocks! Maybe next in line is a NY kind of brownie cookie? I don’t think it is possible to beat the NY Times cookie variations into the ground, because they are such good cookies! I can’t wait to try these- they look very much like some childhood favorites I have been missing. Thanks so much!